Which types of sugar are the most harmful? Not all sugars are created equal. In terms of Secondhand Sugar effects, new research shows that fructose and artificial sugars are likely more damaging. Fructose is often thought of as healthy because it is found in fruit. Part of the issue is that in our current food supply, fructose is taken out of context. It is now mostly consumed in processed foods and drinks rather than whole fruit. Out of the context of whole fruit, fructose is absorbed quickly and the body converts it to fat in the liver. Increased fat in the liver is especially dangerous for your health and metabolism. In children, fructose can accelerate the growth of fat cells. In a recent study we conducted where we analyzed breast milk, we found that small amounts of fructose could be detected, likely due to what the mothers ate or drank. This is of concern because fructose is not naturally present in human milk and infants are not well-adapted to handle it. Artificial sweeteners are also of concern as they can fool the body, which thinks it has eaten sugar. In response to the sweet taste, the body releases insulin, which in turn stimulates hunger and can cause overeating. A recent study conducted in Canada has shown that women who drank diet soda each day during pregnancy were more likely, one year later, to have a baby with a high body mass index, an important indicator of obesity. What can we do to reduce the effects of Secondhand Sugars™? We need to raise more awareness about how Secondhand Sugar™ affects babies in utero, infants, and young children. This awareness can lead to new education programs for families as well as policies to protect children. Just as awareness about the harms of secondhand smoke has become ingrained in our culture and led to effective prevention programs, we need increased knowledge to prompt action related to Secondhand Sugars™. How can pregnant and breastfeeding women protect their children? During pregnancy and breastfeeding, women need extra calories. In pregnancy, a woman is advised to eat around 300 extra calories and during breastfeeding, this amount increases to an extra 500 calories a day. These calories should be added by eating nutrient-dense foods, however, instead of foods and drinks that contain added sugar. A good place to begin is to eliminate sweetened beverages and replace them with water, herbal tea, and other non-sweetened alternatives. Pregnancy is famous for cravings, but these can be satisfied without going overboard. For example, instead of keeping ice cream at home and having it daily, expecting mothers could enjoy it as an occasional treat when out. How can we protect infants beyond breastfeeding? Infants are often exposed to added sugars in infant formula and/or baby foods. We need more education for parents and caregivers to help select lower sugar options. In addition, we need lobbying to make nutrition labels easier to read and to create policies to limit sugars added to these products. 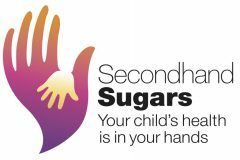 How are children exposed to Secondhand Sugars™? Children are surrounded by sweet foods and drinks that are often heavily advertised on TV. Foods served in public settings like in school lunch programs are often high in sugar as well. Children are too young to understand the harms of these foods and are vulnerable because they do not always have an alternative choice available. We need initiatives to limit the marketing of sugary foods to children as well as improvements to public programs that serve foods to children, particularly those from low income families who may rely more on public assistance. How could the food and beverage industry help? The industry should recognize this issue and reduce sugars in products marketed towards pregnant and lactating mothers as well as infants and children. They could also help develop safer sugars that will not be as harmful to developing children.